Using diamonds in rings can be traced back to the middle ages, and is more popular today than ever before. Because diamonds are valuable and durable in nature, they make a grand symbol of the hope for fidelity and the unbreakable promise of marriage. Although plain gold bands have been the most chosen selection for wedding bands, diamond wedding bands have grown exponentially in popularity. While engagement rings can be made of one single stone, also known as a solitaire, wedding bands with gems usually contain a row of smaller diamonds across the front of the band. Jewelers now offer an array of diamond wedding bands to choose from, with princess cut (also known as square shaped) diamonds being some of the most beautiful, easy to match, and fitting for both men and women. Princess cut diamonds are square in shape, flat on top, and are cut with over 50 facets that reflect light to the gems surface, or face. This gives the diamond more sparkle and allure. Corner prongs are generally used when princess cut diamonds are added to rings, so that the diamonds are secure in the setting, and so that the sharp corners will not chip. Wedding bands featuring this cut are usually paired with engagement rings containing the same diamond shape. Princess cut diamonds can be added to many types of precious metals to create the perfect wedding band. The most expensive of these metals include Platinum (with a price range from $774 to $2,252 per oz), and gold (around $1200 per ounce). Cheaper metals that are used for jewelry and wedding bands include silver and titanium, which vary in price, but are up to 1/75th the price of gold. Different metals do have differing qualities, however. For instance, Gold can be sold as white in color or yellow in color. Platinum and silver are both grayish white, and titanium holds a darker, grayer color. Most princess cut wedding bands are made using gold or platinum. Most jewelers have ring sizers that you can try on in-store, and websites that sell diamonds usually offer printable sizing charts. Buying the right size ring, especially for something as significant as a wedding band, is extremely important. 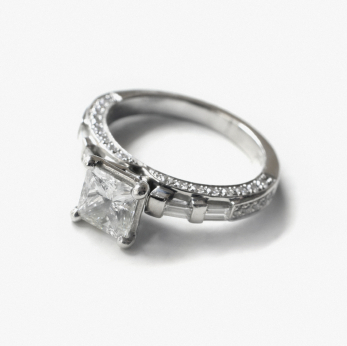 With princess cut wedding rings, having them sized down stretches the metal and can loosen the grip on the diamonds. This can cause your diamonds to fall out more easily. To solve this problem, know what size that you need before you buy or order your band. You should buy a larger size than you normally wear if the band is especially wide. If the band that you wish to purchase is 6-8 mm wide or more, you should choose a ring that is ½ a size bigger than your usual size. Princess cut diamonds are easy to place in any setting, thanks to their shape. This gives you, the buyer, many settings to choose from. The most common is called the channel setting. With this setting, the princess cut diamonds are placed in a row on the band, with no metal separating them. This gives the sleek look of diamonds circling your finger. The invisible setting can also be used with this cut of diamond; Grooves in each stone’s girdle are connected to a metal framework underneath. This way, metals can’t be seen, but the diamonds are side by side, with no space between. This method is often used to make numerous small diamonds appear as one big diamond. This is used in many men’s bands, and is often matched with engagement rings of the same prong setting. The quality of diamonds is always determined by the four C’s; Clarity, Color, Cut, and Carat. Most quality diamonds will have a rating and paperwork that will explain exactly what the diamond specs are. With diamond wedding and anniversary bands, diamonds of the same rating are always used, so that they match and flow together. Look for diamonds that are GIA certified, as they are guaranteed and inspected to the fullest. Princess cut wedding bands can be found anywhere from your local jeweler to home shopping television channels. You can buy them online, from your local department stores, or even build your own, just the way you want it, on certain websites. The most popular, and often expensive, places to purchase wedding bands are diamond retail chain stores like Tiffany, De Beers, Jared, Zales, or Kay’s Jewelers. Cheaper bands can be purchased at your local K-Mart or Wal-Mart. These may not be certified diamonds, although some department stores do offer a variety of them. After deciding what kind of princess cut wedding band that you would like and determining your size, you should shop around for the best price and quality diamonds. Visit your local jeweler and department stores before visiting websites like jared.com or debeers. com. You should also check jewelry chain stores, as they usually have competitive pricing with one another. When shopping, you should also remember that men’s bands will be more expensive than women’s, because they use more metals in order to make. You should also note that many bands can be bought as a set with the engagement ring. This way, they are guaranteed to match and can be bought at one combined price. If you have chosen to purchase a princess cut diamond band over another cut like the round, or “brilliant”, you will be happy to know that the prices for each cut are relatively the same. However, there are cheaper options when it comes to purchasing a wedding band, like a cluster of smaller diamonds or a baguette band. Although these choices may be cheaper, they do not hold shine like bigger diamonds, and can be distinguished as lower-end wedding wear. Your wedding day is one of the most important days of your life, and your wedding band could be the most important symbol you ever wear. A Princess Cut Wedding band is modern and stylish, and is sure to be that symbol of love and loyalty that you never want to take off.